Today was another great day of building. I lucked out today with some extra assistance to keep things moving along. John cut the find down to size and sanded the edges for me. Even sanded the sheeting. Apparently this is one of the reasons why we don’t use the 1/16th that comes with as wouldn’t be able to sand. We don’t do all the final touches on anything until ready to install due to hangar rash, that is the potential for bumps and what not while around the workshop. We’ll want to make sure that sheeting surfaces are sanded smooth, excess glue gone, etc. Before applying the covering to prevent wrinkles, bumps etc. in the covering. I marked the centre on the trailing edge followed by where the hinges have to go using the plans. After practicing with scrap wood I made the slots for the hinges. The other thing I had to do was start rounding the leading edge for aerodynamics. This involved again first marking the centre, marking with a pencil so far from the edge on both sides as to how far to sand for starting the rounding, and then sanding the side edges at a 45 degree angle up to the line to get the rounding effect. 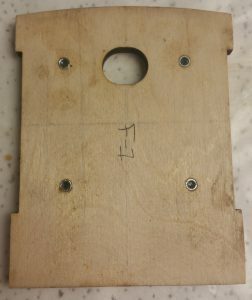 I repeated this process for the stabilizer as well, using the plans to mark where the hinges had to go, the centre position, and making the slots for the hinges. 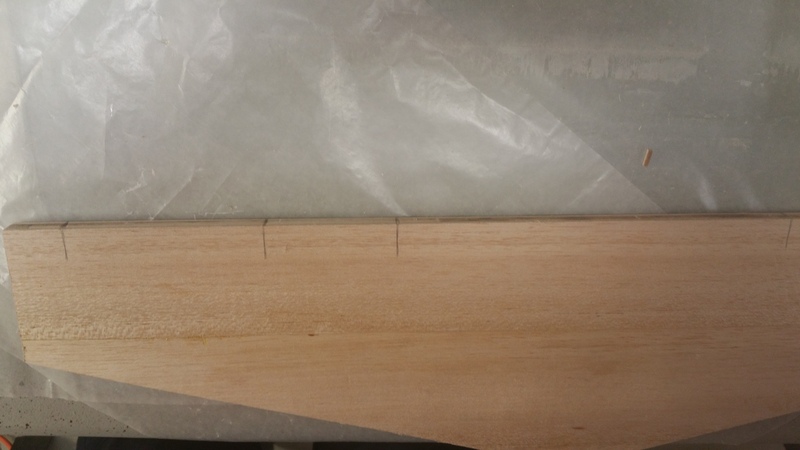 Here I started rounding the leading edges using the same technique. Peter showed me with the fin how to use sandpaper to finish the rounding effect using a finger on each side to apply pressure while moving the sand paper left to right over the edge as well as up and down the length of the edge focusing on one side or the other as needed to even it out. You use the marked centre line as your guide since without it you’d have a hard time knowing what was the centre once you’ve started sanding. On the stabilizer I marked the centre lines on all three sides (not the flat top as no hinge goes here and it won’t be rounded, actually want it to be flat and level for connecting to the body of the plane later). 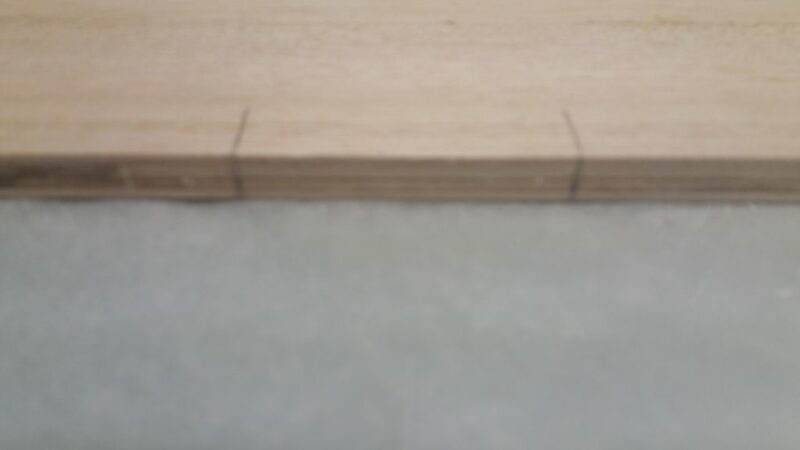 Where you see the pencil marks that is the centre of my hinges, 6 total – 3 per half. 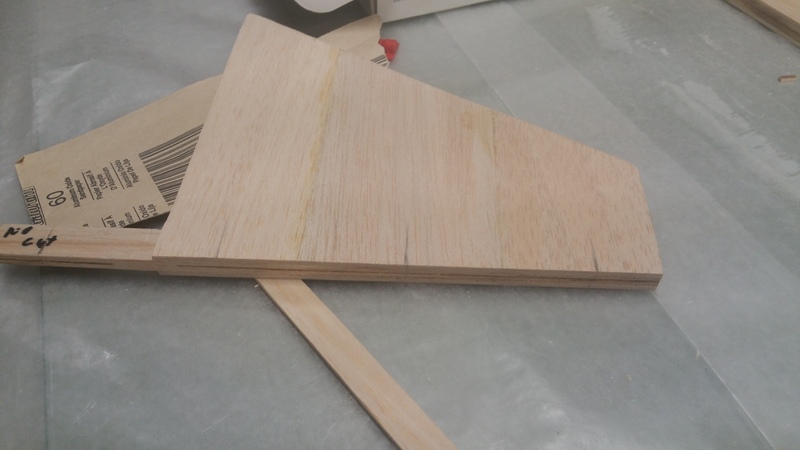 These markings with the long line is to help find hinge placements once covering is applied first to the edge so we can cut out the hinge location before covering the rest and putting the hinge in (dido for the fin). Here’s a closeup of the edge where two hinges are marked and cut. 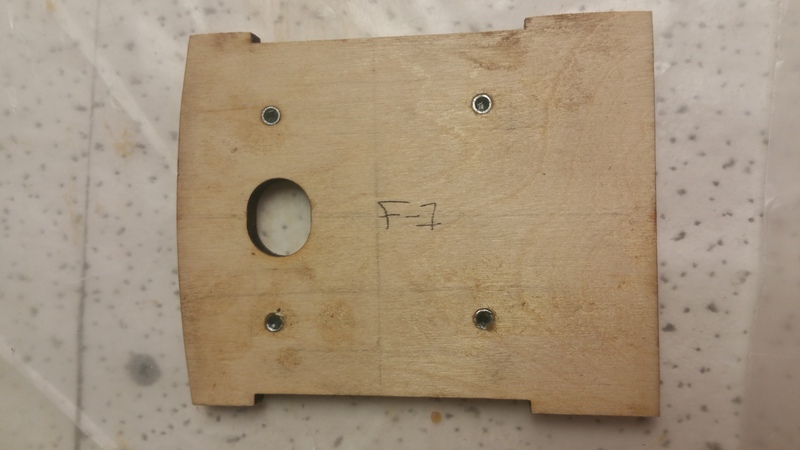 The cut into the wood for the hinge is very hard to notice which is where the markers are very helpful. To continue prepping the fuselage today I glued the fuselage doublers to the corresponding fuselage side as we labeled yesterday. We first traced them to guide us where we need to place it and to know where we can’t allow excess glue to remain. I used a different kind of glue, titebond wood glue, for this as slower to set so absorbs in and creates a stronger bond. As I glued each one we weighted it down to hold it in place and ensure contact is maintained throughout the drying process. We had to ensure we wiped away excess glue from the slots and other areas where future pierces will go. Another big thanks to John and Peter for the work they did on the firewall starting with marking the centre and where the engine lies on the firewall. Peter explained to me how they used Johns Saito 100 4 stroke engine (same engine I’ll be buying for mine) to mark out where the holes have to go to on the engine mounts (they already drilled them for me) and made the small wholes where they’ll be attached to the firewall. They also already had the whole drilled for where the fuel lines will pass through the firewall to the tank. Today I drilled out the 4 tiny wholes to their proper size, 1/16th I believe it was and special tool was used to determine the size of bit required. 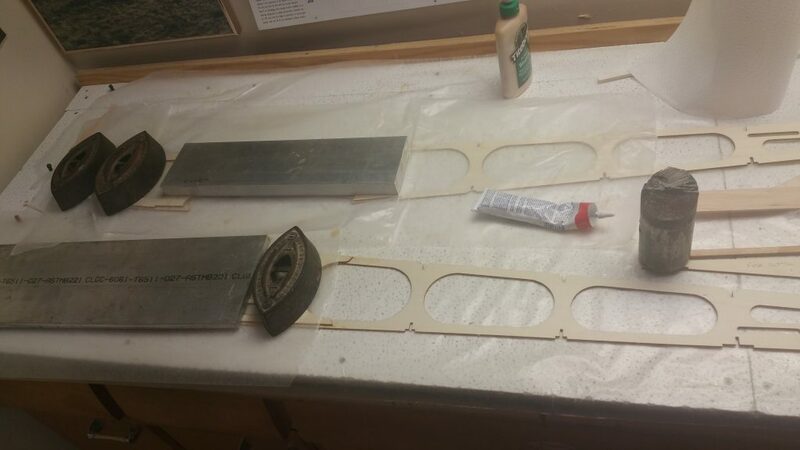 I then placed Vaseline into the blind nuts to prevent glue from getting in as glue was applied around the four holes and then the nuts were pushed into place. The last thing I did for the day was glue the tail wheel mount to the back of the fuselage bottom plate. You can see the round weight over the top holding it down at the right of the pic with the weighted down glued doublers.